Spain’s Socialist (PSOE) government passed a decree on Friday allowing the exhumation of the remains of Franco from his vast mausoleum, a decision that divides Spaniards and has opened old wounds. ‘We are celebrating 40 years of a democratic Spain, of a stable and mature constitutional order … and this is not compatible with a public tomb where we continue to glorify Franco,’ Deputy Prime Minister Carmen Calvo told a news conference following a cabinet meeting that approved the decree. The issue will now be taken to the Spanish Congress, which will have to vote on it. The Ciudadabos (Cs) party and the People’s Party (PP) have already flatly rejected the move by the Socialist government. If both parties voted No to the decree, its approval would be in the hands of the pro-independence parties and Unidos Podemos – which includes Catalan force En Comú Podem, non-aligned over independence but in favour of a self-determination referendum in Catalonia. Prime Minister Pedro Sánchez, who came to power in June after he ousted his conservative predecessor, Mariano Rajoy, in a no-confidence vote, has made removing Franco’s remains from the monument in the Valle de los Caidos (Valley of the Fallen) near Madrid one of his priorities. 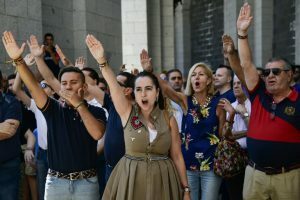 ‘As an established and European democracy, Spain cannot allow for symbols that divide Spaniards,’ Sanchez told public broadcaster TVE shortly after he came to power, saying such a mausoleum would be ‘unthinkable’ in other European nations that had fascist dictatorships like Italy and Germany. Sanchez’s Socialists say the goal is to convert the site into a place of ‘reconciliation’ and memory for all Spaniards. General Franco, who ruled Spain with an iron fist from the end of the 1936-39 civil war until his death in 1975, is buried in an imposing basilica carved into a mountain-face just 50km (30 miles) outside of Madrid with a 150-metre cross towering over it. Built by Franco’s regime between 1940 and 1959 – in part by the forced labour of some 20,000 political prisoners – the monument holds the remains of around 37,000 dead from both sides of the civil war, which was triggered by Franco’s rebellion against an elected Republican government. Franco, whose Nationalist forces defeated the Republicans in the war, dedicated the site to ‘all the fallen’ of the conflict in an attempt at reconciliation but critics say it is unacceptable to give such ostentatious recognition to a brutal dictator. Visitor numbers to the site have soared since the government announced its plans. Spain’s national heritage agency that runs the monument said over 38,000 people visited in July compared to over 23,000 in June. The decree is now expected to pass in parliament as it is supported by far-left party Podemos as well as Catalan pro-independence parties and a Basque nationalist party. But it is fiercely opposed by Franco’s descendants who are refusing to take his remains to the family sepulchral vault, and the main opposition conservative People’s Party (PP) which has warned it will challenge the decree in court. ‘It is more important [to Sánchez] to revive the ghosts of the past than to try to seduce people with the future. He is more interested in opening the wounds of our worst past than in concentrating on our better present,’ new PP leader Pablo Casado told reporters on Thursday. 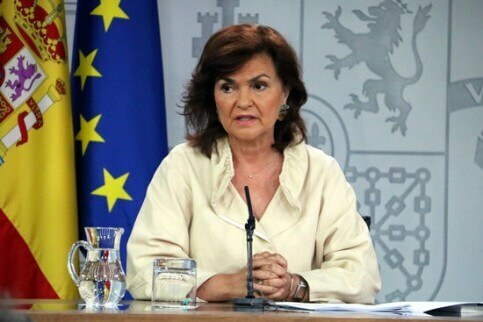 The deputy prime minister said that if Franco’s family refuses to transfer the late dictator’s remains to the family vault, the government will pick a spot to bury him. Starting on 31 August, Franco’s family will be given 15 days to say where they want the dictator to be buried. If they give no indications, Pedro Sánchez’s government will be the one deciding where to place the remains. The pro-independence Catalan parties have urged Madrid to nullify Francoist death penalty and prison sentences, including the one affecting the Catalan former president Lluís Companys, executed by the regime in 1940, if they want their parliamentary support to exhume Franco. The Catalan Parliament symbolically nullified them all in 2017.